On the agenda for day two was an early morning trip to this warehouse that had six levels full of stuff only a digger would dream of. Making it to the warehouse was one of my major goals of the trip. Amanda had told me so much about the sale and said that it would be going on for a few more Saturdays. Not only did I want to meet up with some fellow vintage lovers, but I also wanted to check out this sale; Amanda made it sound soooo good!! She was totally right. 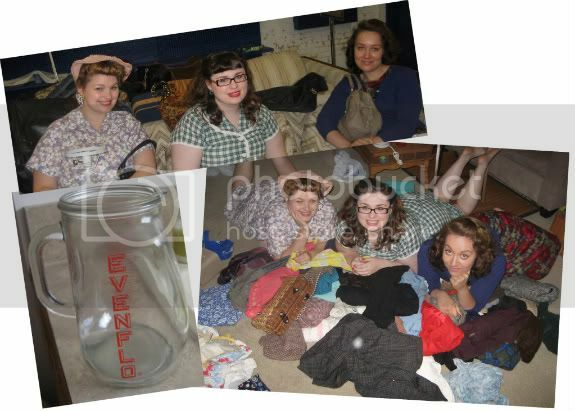 So Saturday morning, we all donned our best Rosie the Riveter outfit and headed off to the sale. Since Amanda and Brittany had been there before, they knew the best place to start. The 5th and 6th floors is where all the clothing and textiles were. The girls think this building may have been used as a Goodwill sorting facility, as there were huge bins formed around movable pallets. We spent about 2.5 hours there and all came away with some really great stuff. 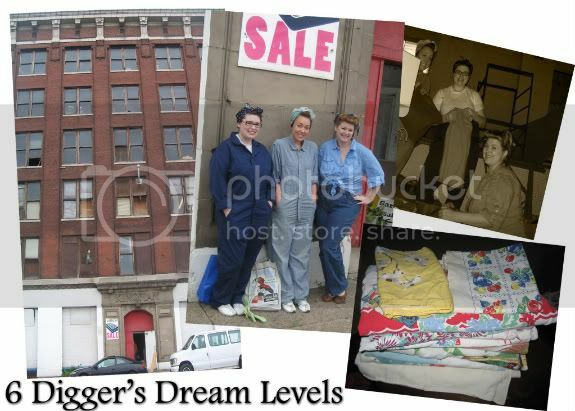 The pile of linens pictured above was found in the warehouse and most are in fairly good condition. 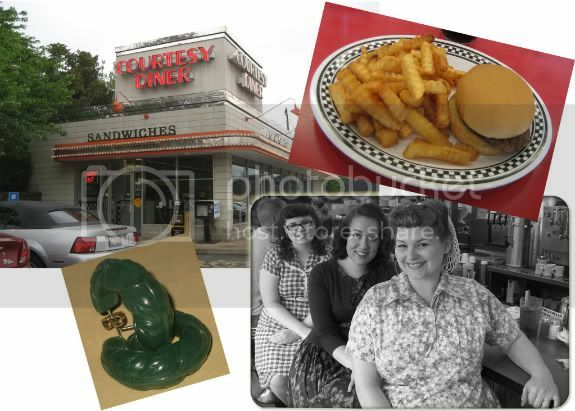 After the warehouse, Brittany took us to this sweet little retro diner that served up the best greasy food!! :) Us gals had a fun time changing in the bathroom and helping each other out with fixing their hair. It was pretty packed, so we opted to sit at the counter rather than wait for a table. I think it turned out to be a great idea since we were able to get this really adorable picture of the three of us. Those green earrings are the ones I got at the Value Village the day before. The girls were so sweet to let me have them, as they matched my outfit perfectly. Check back tomorrow for the final part of my trip! Just AWESOME! I LOVE that picture of you three with your "Haul!!" That's so fun! There is a warehouse I 'dig' at where I live, but it's not nearly as large as that one.